A 3-year-old sled dog who went missing hours before the start of the 2019 Irving Woodlands Eagle Lake 100 sled dog race on Saturday has been reunited with her owner, who never gave up hope of finding her. 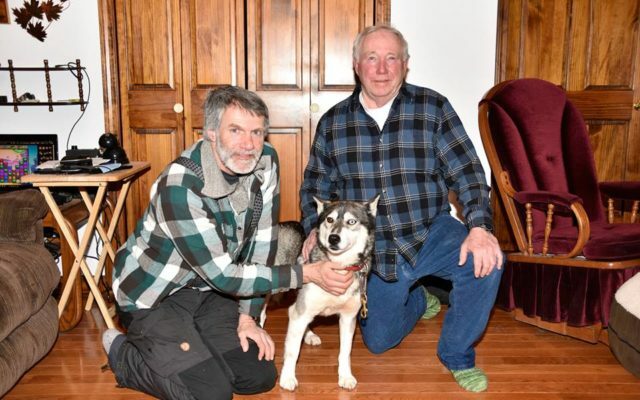 EAGLE LAKE, Maine — A 3-year-old sled dog who went missing hours before the start of the 2019 Irving Woodlands Eagle Lake 100 sled dog race on Saturday has been reunited with her owner, who never gave up hope of finding her. Quebec musher Gilles Harnois and his team of sled dogs were staying in Eagle Lake to compete in the races when his Siberian husky Kaisha took off at 5 a.m. Saturday morning, five hours before the start of the 100 mile race. Harnois decided to race anyway in the hope Kaisha would pick up the scent and try to go to the team. He finished the race in the wee hours Sunday morning without having any luck finding Kaisha. But he remained in Eagle Lake and kept searching fervently for his dog. The veteran musher said he walked, ran and rode snowmobile throughout the woods in the Eagle Lake area to try and find his beloved dog, even during a winter storm that dropped nearly two feet of snow on the St. John Valley Sunday into Monday. Eagle Lake resident Roy Roalf volunteered his time and snowmobiles in the search for Kaisha, and at 4:30 p.m. on Tuesday, Jan. 22, three days after she went missing, Roalf and Gilles finally spotted Keisha on a snowmobile trail far from town. “We found her about a half-a-mile from Honeywell Pond,” Roalf said. Kaisha was in good physical shape, although frightened when the two men found her. Harnois was ultimately able to calm Kaisha, who he described as a shy dog. Harnois drove Kaisha on snowmobile back to Eagle Lake. “We had two of my snowmobiles. I had the bigger machine so I swapped machines with him and he carried her all the way back 20 miles,” Roalf said. When the three arrived back at the Roalf residence, Kaisha feasted on a fish dinner. Roalf said he was happy to help reunite Harnois and Kaisha. “We have a couple of dogs ourselves so I figured if I can help him out I should do it, and it worked,” Roalf said. He added that he was happy to see the joy Harnois displayed when he was reunited with Kaisha. Harnois, Kaisha and the rest of the dog sled team planned to return to Quebec on Wednesday morning.